Marelle Taylor Stampin' Up! Demonstrator Sydney Australia: More Springtime Stems! 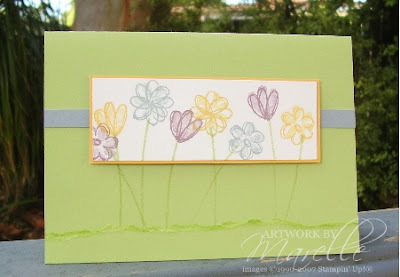 LOL, winter must be getting to me...I seem to be doing a lot of "springy" cards lately! This set really lends itself to sweet and simple cards, and those are right up my alley. Here I've used Certainly Celery, So Saffron, Bordering Blue and Perfect Plum. The first step of the 2-step stamp was done by stamping off once. The "grass" was done by tearing a piece of Certainly Celery and inking the edge of it.